Whenever I travel, there are two things that I will always bring with me: a toothbrush and music. Music is what helps me get through long road trips or long plane rides. I like to think of it as a soundtrack to my vacation. 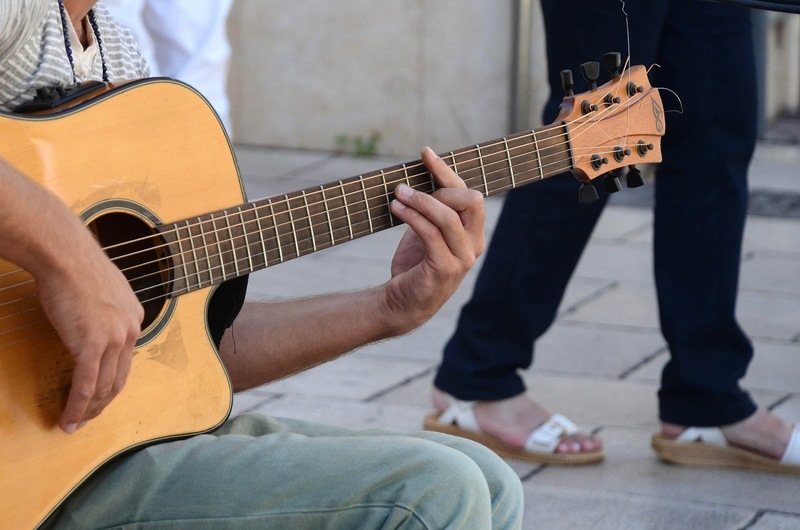 The genre is generally anything that is upbeat and fun. 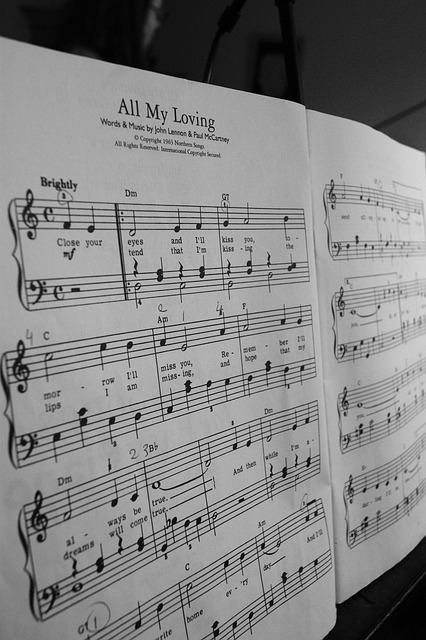 The lyrics will usually speak to the journey that awaits me when I arrive to my destination. Now, I should say that I am writing this post with a heavy heart. Recently, the music world lost Eagles guitarist Glenn Frey. Frey died January 18th at the age of 67. I grew up listening to the Eagles. One of my favorite memories from my travels is driving along a long dusty highway in Mexico with my husband, listening to “Hotel California” and “Tequila Sunrise” over and over and over again. The Eagles has been a featured band on my vacation soundtrack for many of my trips, including the one to Totos Santos. I wrote about that trip recently. Frey’s death had me reminiscing about those few days my husband and I were in Mexico. Rest in peace Glenn. I will forever embrace your legacy during my travels around the globe. What’s the soundtrack to your vacation? Are there songs that you will always listen to when you are traveling to your International Vacation Home Exchange? Are there songs that bring you back to that trip to Mexico, or France, or Hawaii? When you walk alongside an ocean, is there a particular song that plays in your head? Music has a way of setting the backbeat to any trip. You may pass the time on a road trip by singing your favorite songs out loud. These memories will follow you for the rest of your life. And every song from the musical “Wicked”. Wherever your travels will take you, be sure to set the soundtrack for your vacation. I love my son. I love his giggles. I love his snuggles. I love watching him discover the world. And most importantly, I love being his mommy. But being a mom can be exhausting. It is a full-time job where there are no sick days or paid days off. I also work full-time as an instructional designer. Needless to say, I could use a little time to myself. I know I am not the only one. I’m sure there are several women out there in need of a little momcation. What is a momcation exactly? It is a vacation from your motherly duties. In other words, it is a break from housework, homework, tantrums, and Mickey Mouse (seriously, if I have to do the hot dog dance one more time…). And if you are a mom, you should consider taking a momcation. Why? Well, there are a few reasons. 1) Motherhood is a full-time job. We are always told to take vacations from work to help recharge the batteries. Well, motherhood is a full-time job and like any profession, you need a break. Even if it is just for a few days. 2) Your partner (or other caregivers) may appreciate you more. Now generally, spouses or partners already recognize the work that you do to care for your family. However, they will likely gain a whole new level of respect when the shoe is on the other foot so to speak. 3) Your little family will grow. Believe it or not, removing yourself for just a little while may help your family bond in your absence. Are you ready to pack your bags yet? I know just writing this post makes me want to book a momcation right away. However cost can be a big factor for moms who are working with budgets that include diapers, clothes, and formula. Some good news - you can enjoy an affordable and fun momcation. How? Here are a few options. 1) Take a road trip with a close friend. You don’t have to travel to the ends of the Earth to get a little mommy time. You can grab a friend and take a weekend trip to a nearby city or town. You can split the costs for gas and food. 2) Go on a trip with your significant other. When was the last time you took a trip with your partner when it was just the two of you? Arrange to have someone watch your kids, book an International Vacation Home Exchange, and head for the airport or train station. Many airlines have been pushing deals lately, so start doing some research. 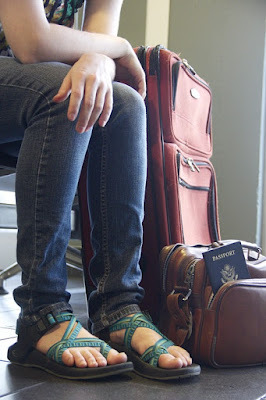 3) Or travel solo. Maybe you don’t have access to someone to watch your kids. Hand off the motherly duties to your partner and take a solo momcation. And be sure to pamper yourself. Remember, you don’t have to worry about naptimes or tantrums. You can even sleep in if you want. Even moms need a little break sometimes. And a momcation is the perfect way to recharge your mind and soul. I promise your kids won’t suffer any long-term damage in your absence. Hopefully your husband will still be on speaking terms with you when you return (he will, trust me). So what are you waiting for momma? Time to put down that Dr. Seuss book and start planning all the places you can go on your momcation! New to the concept of Home Exchange? Download a FREE Home Exchange Guide for helpful hints and tips. 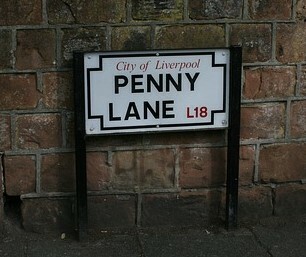 Did you know that Strawberry Fields was actually an orphanage located near John Lennon’s childhood home in Liverpool? He would pass it each day on his way home from school. One of John Lennon’s favorite things to do as a boy was to stop there and either climb the trees on the property or play with the children who lived there. It’s no longer an orphanage today but the sign still remains, making it a popular tourist stop. This is just one of the many facts that fans of the Fab Four can learn for themselves on a Beatles pilgrimage to England. 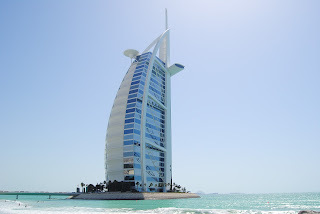 I’ve listed some of the other must-see attractions you can personally experience by booking your next luxury home swap in the UK. A dream photo op for any true Beatles fan is to have their picture taken as they walk across that world famous Zebra Crossing (as it’s called in England). That famous walk was taken on Abbey Road, London near Abbey Studios. When my family and I took this iconic walk a few years back, my youngest was 7. He was a big Beatles fan and wished to take on the role of Paul McCartney. In true album cover fashion, he was 3rd man down and walked barefoot. Of course, we said “no” to the cigarette when he requested one. The picture is one of our favorite mementos of our years spent living in London. The Abbey Road Crossing is a short walk from the St. John’s Wood tube stop. There is always a crowd gathered and waiting your turn to have the crosswalk all to yourself requires a bit of patience but not nearly as much patience as the folks who drive that route on a daily basis. Both homes are now part of the National Trust and have been remodeled to look as they did during the years John and Paul were growing up. The homes are located in close proximity to one another. As you drive down the actual Penny Lane in Liverpool you are able to recognize many of the landmarks from their well known song. The “shelter on the round about” refers to an unusually large bus shelter that is described as being on its own “island” because it’s located on a roundabout where traffic encircles it from all angles. The barber shop in the line “barber showing photographs of every head he’s had the pleasure to know” refers to a barbershop that was located just behind the roundabout. Inside the shop, customer’s pictures were hung on the wall. The shop still stands in the same spot today though it’s no longer a barbershop. I won’t ruin the rest of the Penny Lane sights for you but just remember to not leave without a picture by that well known street sign. No visit to Liverpool is complete without a stop at the spot where the Beatles were discovered back in 1961. 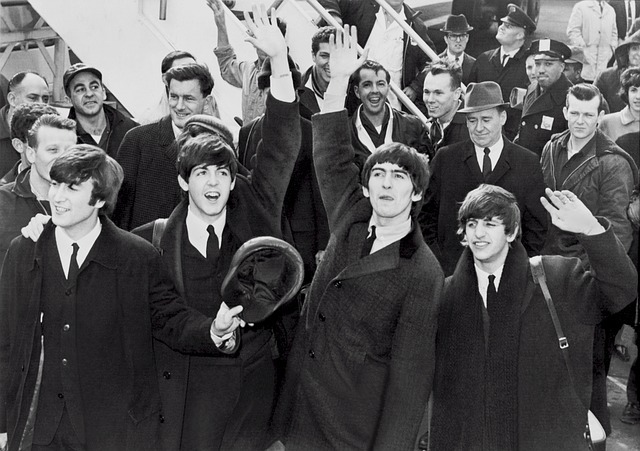 The Beatles made The Cavern Club a worldwide household name. It continues to host live bands to this day. This interactive museum is located in Liverpool’s Albert Dock area. There you can follow the life story of the Beatles in this fun, kid-friendly museum. Located in the Mayfair section of London, The Hard Rock Cafe houses a rock ’n roll museum in it’s basement. There you can see the original handwritten lyrics to “Imagine” and “Instant Karma” plus the glasses and jacket often worn by John Lennon. 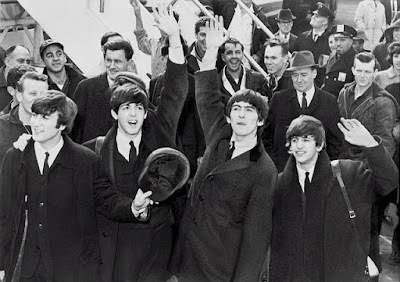 These are just a few of the Beatles attractions you can experience first hand on your dream vacation to the homeland of the Beatles. International Vacation Home Exchange has properties in over 70 countries around the world. Click here to view properties available in England. Imagine standing right where John and Paul once stood. It’s easy if you try. Note: if you have a couple hours while in Liverpool, try a Beatles Black Cab tour - fantastic. Your cab driver takes you to many of the local Beatle sites mentioned above, while sharing with you their personal knowledge of Liverpool - plus they mix in Beatles song along the way - listen to Penny Lane on Penny Lane, Strawberry Fields at Strawberry Fields, absolutely fabulous. 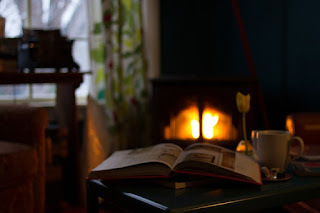 What do beach vacations, long plane rides and sitting by a roaring fire after a full day of skiing all have in common? No, the answer is not Gin and Tonic (though you get partial credit for that), the correct answer is they offer the perfect opportunity to get lost in a good book. 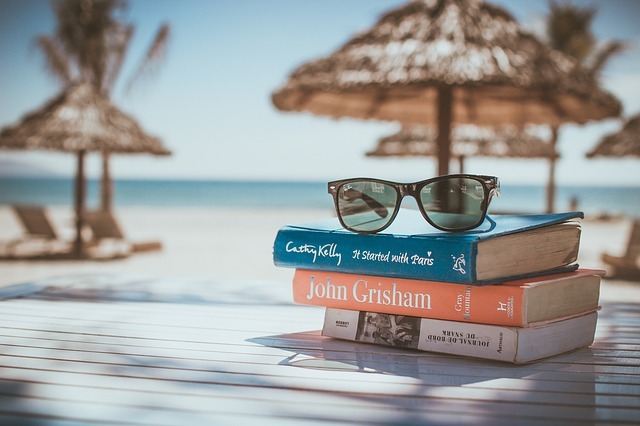 As you plan your next luxury home exchange look through this list of some of my all-time favorite books and make your next trip even more relaxing and enjoyable. Probably my #1 favorite book. It’s an incredibly well written thriller that is nearly impossible to put down. When Jake Fisher’s girlfriend unexpectedly breaks up with him and marries another man, she makes him promise to leave them alone and to never try and contact them. Jake does so for six years until circumstances arise that make him need to locate her. You’ll find many twists and turns in this plot that will keep you guessing right up until the very last page. Not a creepy Stephen King novel in the slightest bit but an historical novel about time travel and the assassination of JFK. It’s a long read, about 900 pages, but the story never drags. It’s a real page turner as you try and predict what will happen next. One of the most well written books I’ve ever read but I wouldn’t expect anything less from Stephen King. A well written psychological thriller that takes place in a London suburb. Rachel Watson watches the world go by each day from her commuter train. She’s particularly interested in a couple she often sees out on their terrace. When this woman goes missing, Rachel tries to piece together the details of that night in her mind. The suspense unfolds as Rachel becomes obsessed with this couples’ life and the woman's disappearance. One of the most interesting novels I’ve ever read. The story weaves both past and present. It portrays a woman whose gift for flowers helps her change the lives of others while struggling to overcome her own obstacles in life. It’s a beautifully written and quite moving story. 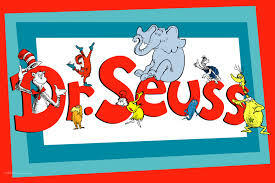 The story takes place on a tiny island in Australia where a lighthouse keeper and his wife are the only inhabitants. The couple is unable to have children. One day they find a rowboat has washed ashore and they are surprised to find a newborn baby inside. They decide to tell no one the truth and claim the child as their own. As the child’s history begins to unfold, the couple is forced to make some tough decisions. The story knits together the past and present of two women, one young and one elderly. It’s an historic journey of survival and the yearning for a home and a sense of belonging. I read this book several years ago but it’s a story that has remained with me over time. It’s a memoir that deals with the author’s humble and troubled childhood. Jeannette Walls has overcome her struggles and is a successful writer and journalists for MSNBC.com. You’ll have a difficult time putting this one down as it keeps you wondering about what could possible happen to this family next and wondering how they will overcome their latest hardship. I was reluctant to read this book as it’s a memoir about her battle with breast cancer. I was glad a friend finally talked me into reading it because it has become one of favorite books. Though the author does talk about her medical struggles the book is really about her relationships with the people in her life. She writes a lot about the special relationship she has with her father who was also going through cancer treatment at the time. Kelly Corrigan is now one of my favorite writers. She has a real gift for putting her thoughts and feelings into words. This is not at all a depressing book and in fact many parts are quite amusing. You’ll be glad you read it. What’s on your list of favorite books? We’d love to hear about them in the comments section. IVHE has luxury properties in every corner of the world. 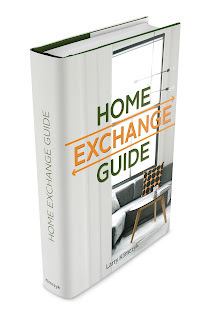 To learn more about home exchange, download a FREE home exchange guide. Start planning your next get-away today and don’t just read about adventures but live them. 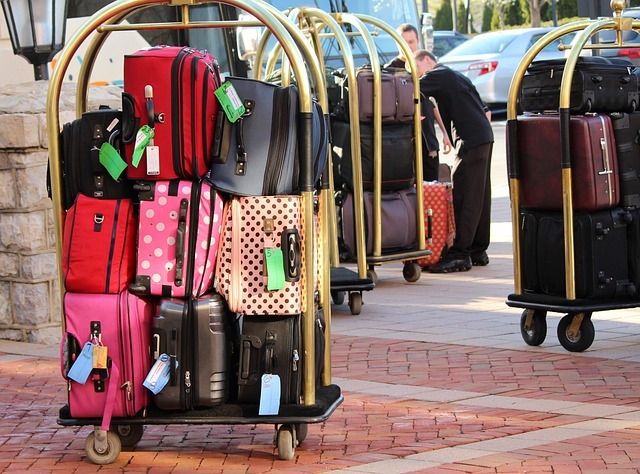 So it’s a new year and you’re excited about your 2016 home exchange vacation plans but you dread the task of packing. I’m with you on this. I love the idea of exploring someplace new but the thought of having to pack for it…not so much. I’ve put together a list of packing tips that have been the most useful to me over the years. I hope they make preparing for your next adventure a little bit easier. Eyeglass cases make the perfect container to hold cords for your iPhone, Kindle,iPad etc. It keeps them all neatly in one place. Keep everything in your suitcase clean by putting shoes in shower caps. It will protect your suitcase as well. Save space by rolling your clothes instead of folding. This also cuts down on wrinkles once you unpack. Keep necklaces untangled by putting one end through a straw. Another great way to keep jewelry from tangling is to put it in between two pieces of Press and Seal Wrap. It keeps all your pieces right where you put them until needed. Avoid spills by putting a piece of Cling Wrap over the bottle opening before putting the cap back on to avoid spills in your luggage. I learned this one the hard way. 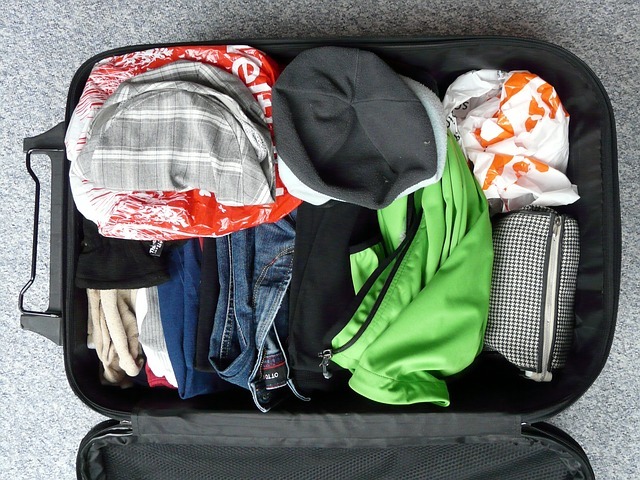 Pack a small zipper bag in your carry on case with things you may need on your flight. Things like earbuds, lip balm, reading glasses, tissues, aspirin, gum or anything else that you think you will use. This allows you to put your carry on in the overhead compartment while keeping things you need close at hand. The two key points to packing is being organized and planning ahead. Procrastination is the traveler’s enemy. Make a well-organized list way ahead of your departure date. Jot down items as your think of them. Put aside items on your list as they come to mind. If you wait to put them aside chances are you will forget something. Don’t waste precious vacation time shopping for all the things you forgot to pack, detangling your jewelry or ironing out wrinkles. With a little planning and organizing you can be well prepared for your get-away and use your vacation time to sightsee and relax. After all that’s what vacation is all about. What are some of your favorite packing tips that make your life easier? We’d love to hear about them in the comments section below. Now if there were only a travel tip that would get my kids to remember their shoes when they get off a plane. A new year means new travel goals. International Vacation Home Exchange has luxury properties in every corner of the world. What’s on you Bucket List? Contact one of the IVHE Personal Trade Coordinators today and start planning your 2016 adventures. Invariably, after an airplane has descended, as it’s shuttling across the tarmac to the gate, you’ll hear the cabin fill with a chorus of beeps and chimes – smart phones coming back to life after their brief respite in the off position or on “airplane mode.” This scene plays out all across the globe, hundreds of times a day, and it’s only one example of the remarkably connected world that we live in today. It’s great to be able to stay connected with the outside world while you’re traveling. You have the peace of mind that, were an emergency to come up, you have an open channel to contact whoever you might need to. You can access your bank and email accounts, keep up with friends and family, and even catch up on work without ever having to touch a PC. 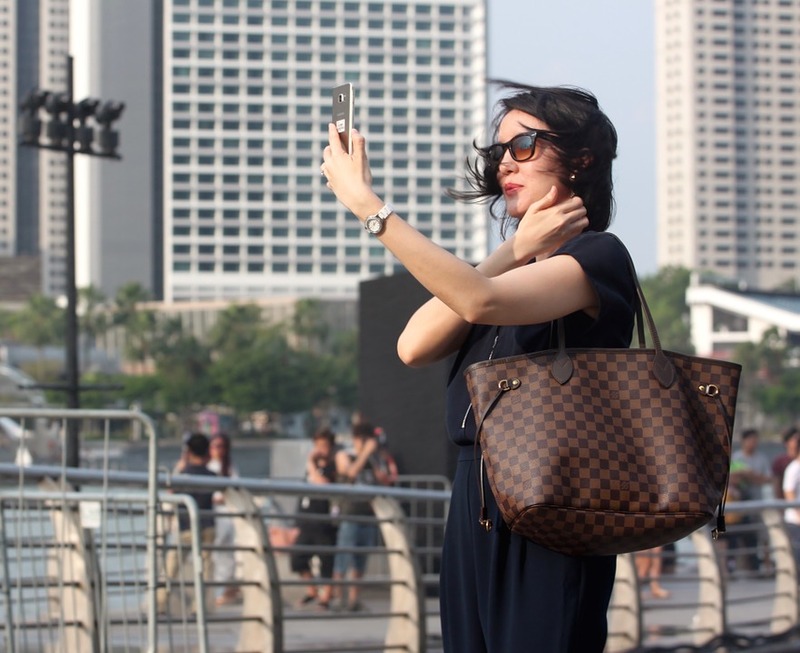 All of that is fantastic news for the frequent traveler, but a host of problems can arise as a result of the constant use of social media, from “tech neck” to depression. The world has become incredibly interconnected. There is internet access and cell service nearly anywhere you might dream of going. So, unless you plan to travel only to remote destinations from here on out, you might find yourself succumbing to the temptation to check your phone every two minutes, perhaps missing out on the fun of your trip. A vacation should be a time to relax. Think of it as something of a “reset.” The quickest way to diminish the refreshing effects of travel is to stay stuck to your smart phone. So how do you walk that thin line between staying connected and staying over-connected? The first step is consciously making that distinction and becoming cognizant of how much time you’re logging on the phone. Social media is one quick way to pull your attention away from the sights you should be seeing. 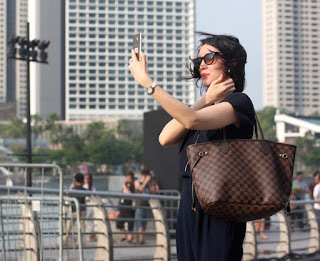 Sure, it’s great to snap a quick picture and post it out for your friends to see, but you might find yourself 20 minutes in, staring despondently at your screen as you scroll through status updates and your vacation passes you by. 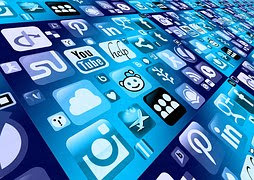 A good start to stopping the attention drift is to set aside specific blocks of time to upload pictures and check social media. You can use your phone to take pictures as you go along, but wait until you’re settled in for the night to post them all and catch up on how your friends and family have spent their days. Work is another of the cardinal offenders when it comes to vacation distractions. The nature of the digital age in which we live is that business and commerce are now conducted globally on a 24/7 schedule. This mean that, often, you’ll receive emails or calls from coworkers on a trip. “It’ll just take a moment to respond,” you say to yourself. When you look up next, you’ve spent an hour reading messages and tying up loose ends. The fix for this issue requires a little preparation. Before you set out on your travels, let your colleagues know. Make sure to give anyone who may wish to contact you guidelines. For instance, ask them to send you an email and warn them that you will be looking at your email at specific times of the day. If possible, designate another person in your office to serve as your proxy. Impose the same sanctions on your work email that you might on your social media accounts and set aside specific time to catch up on work. 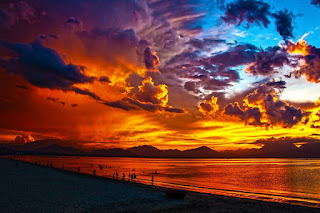 All-in-all, it doesn’t have to be a huge hassle to find the appropriate balance between staying connected and getting away from it all. Make sure you set clear boundaries – both with yourself and your friends and coworkers – about when and for how long you’ll be reaching out. If you find you have to disable notifications or set your smart phone to vibrate, then do so and get on with enjoying your vacation. You might find it such an enjoyable experience that you carry some of these habits into your everyday life – which may just help us stave off the societal decline of the attention span. It’s quite possible to lose yourself in the constant flow of information that’s now available in the palm of your hand, so make sure that you make an effort not to give into the temptation to let your mind wander. You’ll find that you return from your trip refreshed, relaxed, and ready to connect once more if you make the effort to unplug long enough to enjoy your vacation. What better way to relax than to go on a home exchange vacation? You can relax on in a exclusive property with all the amenities of home, while also immersing yourself in a local culture. Choose from luxury homes on the beach, in the mountains, on golf courses and many more….. Though many cities around the world offer Mardi Gras celebrations, no one does it quite like Venice. 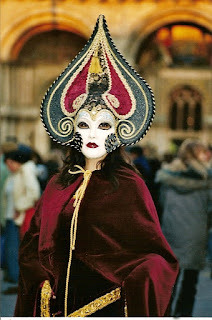 During Carnival of Venice, the world famous St. Mark’s Square is filled with women adorned in elegant gowns and detailed masks and men draped in flowing cloaks and wearing ornate disguises. Venice offers the perfect backdrop for these festive party goers. 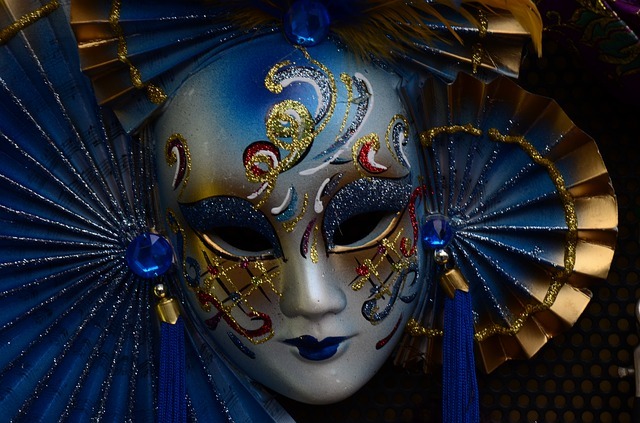 The history of Carnival of Venice dates back to the 11th century. Venice was known to operate under a caste system. Carnival was a time where Venetians of varying social classes were able to mingle anonymously. The masks also gave attendees the ability to partake in undesirable activities without risk of being recognized. This Venetian tradition fell into decline in the 18th century. It was revived in the late 1970s and continues to be a popular Venice attraction today. Each year Venice welcomes more than 3 million visitors to its Carnival each year. I had the pleasure of attending the celebration a few years back. As an added bonus, the event that year was held during my February 14th birthday. It was the perfect setting for a Valentine’s Day/Birthday/Fat Tuesday celebration. The Carnival of Venice is marked by live music in the main square, theatrical performances and street entertainers. There is a skating rink set up in Campo San Polo. 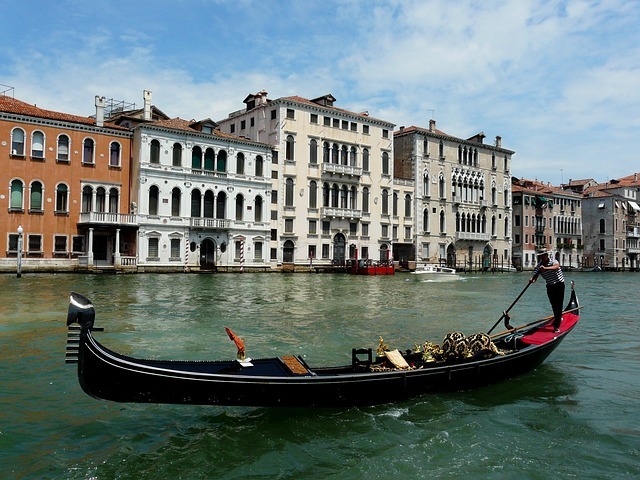 You’ll want to be sure to watch the procession of decorated boats and gondolas as they make their way down the Grand Canal. 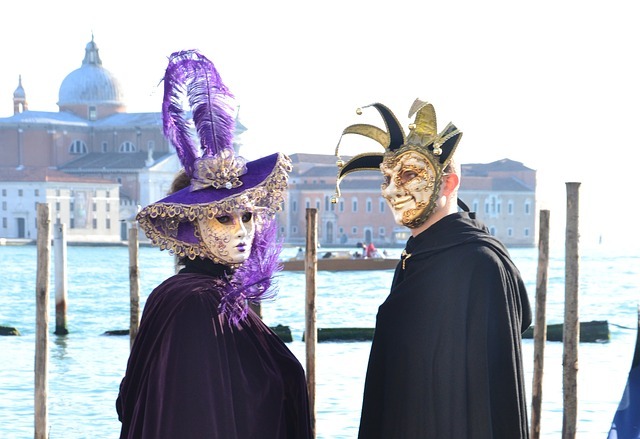 The annual costume ball called Gran Ballo dell Maschere takes place in a different Venetian palace each year. Don’t miss the Volo dell’ Angelo (flight of an angel) where you will see the traditional Angel of Carnival fly on zip wire over St. Mark’s Square. You can always take a break from people watching to see some of the sights Venice has to offer. 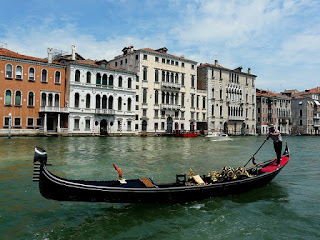 Tour St. Mark’s Basilica or see Venice from the Grand Canal onboard the Vaporetto (water bus). You can tour Doge’s Palace and crossover the Bridge of Sighs. It goes without saying that no trip to Venice is complete without a gondola ride. If you are looking for that special souvenir, visit Murano Island and watch a glass blowing event or visit one of the other lagoon islands like the colorful island of Burano. Of course the best thing to do when in the Floating City is to just “get lost in Venice” by wandering around the quirky cobblestone streets and alleyways. Start your New Year off right with a new adventure in one of International Vacation Home Exchange’s properties in Italy. Add this annual Venetian celebration to your travel plans and watch how Carnival transforms Venice into even more of a magical place, if that’s even possible. Many of have set goals in the New Year to get in shape. Sticking to an exercise routine, though, is easier said than done, especially if you are traveling. It may be hard to stay motivated to exercise while you are on vacation. 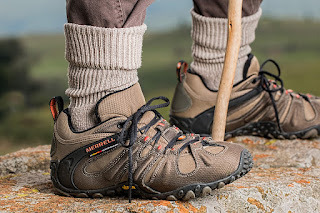 The good news, you can stick to your exercise routine while you travel. In fact, you can simply bring the gym to your vacation home exchange. And aside from a good pair of shoes, you don’t have to pack a single fitness tool. Now, I should mention that many International Vacation Home Exchange properties may have gym facilities nearby, or on the property itself. There are also properties that offer plenty of room to walk or hike, or is enjoy swimming to keep fit, you can search by vacation properties with a pool. If that is indeed the case, then try to squeeze in 30-60 minutes of exercise each day. If you don’t have a gym nearby, there are exercise movements that you can simply do inside your home exchange. Before I provide suggestions, I should remind everyone to always consult with your physician before you begin any exercise routines. Below are some examples of workouts that can help you stay fit without leaving the comfort of your home exchange. I should mention many of these workouts will only take you 10-30 minutes and you can do these workouts as a family. Be sure to warm up and stretch before beginning any of the above workouts. If you have some workouts that you enjoy doing while on vacation, please share below. I would love to know what everyone else does to stay in shape while on the road.